Short ads are good, Facebook and Google aren't the only game in town, and media companies should stay worried. Short ads are good, Facebook and Google aren’t the only game in town, and media companies should stay worried—at least according to Business Insider co-founder and CEO Henry Blodget, who spoke at the Digital Media Strategies USA conference in New York City on Wednesday. 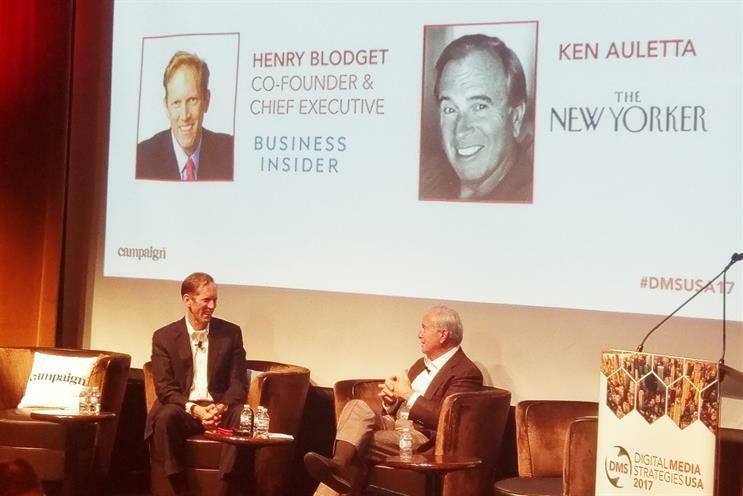 Billed as a fireside chat, his wide-ranging conversation with The New Yorker’s Ken Auletta touched on the history of the news organization, its impressive success and its future, as well as that of the news business as a whole. Naturally, the pair began by talking about funding. "A lot of people are trying to identify a ‘correct’ model—it’s either advertising or it’s subscriptions," Blodget said. "I think they both work. Unless you are the New York Times or the Washington Post and you are a general news site, it’s very hard to create a subscription business." Both the NYT and the Post have seen a sharp rise in subscriptions in the last year, partly owing to increased political coverage, while Business Insider hasn’t implemented a paywall. Other media companies, like Mic and Vocativ, have laid off staff in a "pivot to video" content, an approach Blodget ridiculed, calling the notion that the same outlet could make video work without succeeding with the written word first "a hallucination." "Video is just as difficult as text, perhaps even more so, and if you haven’t been able to figure out the text model, you’re not going to be able to figure out the video model," he said. "It’s certainly not going to save the text piece." Besides, he added, "There are many, many stories that work better in text," given increasingly short audience attention spans. That’s one reason Blodget lauded a move to shortened 6-second ads. Native and branded content is often long and in-depth—not a positive in and of itself, he said. And it scales poorly. "17,000?" he said, referring to a native ad’s hypothetical reach. "That’s a joke. Add three zeroes and it starts to get interesting to a broad marketer. If we can move to the 6-second unit, if advertisers start to embrace that and can see the creativity that’s in there, 6 seconds is much less intrusive. Those can be scaled, because you can make that one and show it a billion times." Both Blodget and Auletta lamented decreasing trust in news, Still, though much of the GOP faithful dismissed the Washington Post story citing allegations of child molestation by Alabama Senate candidate Roy Moore—a story Auletta called "bulletproof"—Blodget noted that it’s beginning to have an effect. "Now even Fox News folks are turning against him. Journalism still works even if people instinctively don’t trust it because it’s coming from a particular organization," Blodget said. It’s part of a worrying trend in the rise of fake news, and he insisted that platforms like Facebook and Google that have a hand in disseminating falsehoods—even unintentionally—should be held to account. "Imagine that Russia, for example, somehow secretly hijacked NBC and was using NBC to influence America," he posited. "People would have an instant heart attack. There would be outrage everywhere, they would be all over it. Facebook has to figure out a way to be on that, control it, same as any other platform." Blodget also predicted that the next few decades will see the arrival of peak media, a time when the average consumer is so saturated with information that there’s no more time in the day for additional media consumption. To cope with the uncertainties Business Insider and other media organizations face, "try to wake up terrified every day," he said. "The speed of industry evolution has always been a challenge. Every year there’s been something else to adapt to." But he remains hopeful. "Human beings will always want entertainment and great stories," he said, "and the only thing that’s going to change is who’s going to give it to them."